Loggos is a small fishing charming village on the east coast of Paxos just around the corner from the famous Lakka. Tavernas and bars surround the harbour, a very pleasant place to sit and relax. There are three mini-markets and a baker shop which have a good selection of products and also fresh fruits and vegetables. Getting about the island from Loggos is easy. 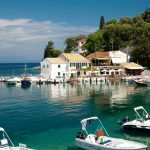 There are bus services going to the other main villages of Paxos -Giaos and Lakka. There are also care hire, scooter hire and bike hire facilities.